Yet another shocker in Madrid occurred yesterday, when Kei Nishikori beat defending champion Roger Federer 6-4, 1-6, 6-2. It was a very interesting match – one where each set had its own, very distinct personality. The first set was saw Federer win one more total point than Nishikori and lose only 5 points on serve. Yet the Swiss ended up dropping the set anyway, as Kei played one excellent return game (and 4 pretty bad ones). The second set was all Federer, as Nishikori became more erratic and couldn’t muster any more hot return games. And then the decider started as a tight affair, but soon enough Nishikori ran away with it, as Federer unraveled in a heap of unforced errors and got broken twice. For the first time I decided to do a posthumous Consistency Ratings piece for two reasons. First, I hadn’t had a chance to track Roger Federer’s shots yet (the first Consistency Rating piece appeared during Miami). 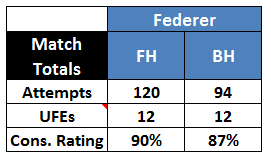 Second, I wanted to see what his Consistency Ratings looked during this seesaw match, and try to see how Federer’s numbers influenced the outcome of the match. Without further ado, let’s dive into the numbers. When I tallied the numbers for the first set, I could only marvel at the table above. 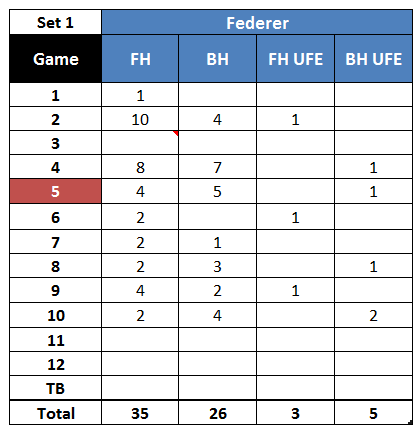 Roger Federer had to hit only 19 shots in 5 service games (smashes are not included). Just 19. In Game 3, the Swiss held serve without even having to hit the ball after he served – all four points were won via unreturned serves. Simply put, this is why Roger Federer is still competitive at age 31, and a big reason for his incredible success over the years. The man holds serve with ease. He barely spends any energy in doing so. There are very few people on the ATP tour who can consistently put pressure on the 17-time Slam winner. Why would Federer walk away from the game when he’s got such an edge on a significant portion of the ATP tour? 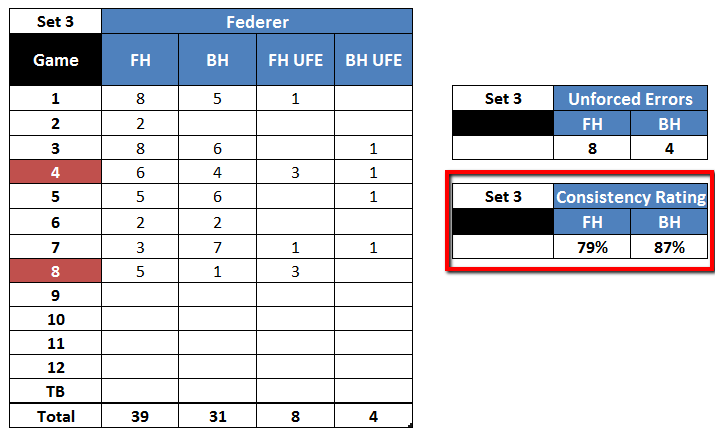 To further emphasize this, here are Federer’s service numbers for the match: 65% 1st serves (and that number is above 70% for the first two sets), 74% of 1st serve points won, and 65% of 2nd serve points won. Those are fantastic numbers. 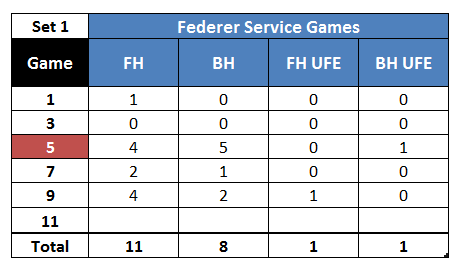 Kei Nishikori was lost at sea in terms of returning Federer’s serve during sets 1 and 2 (with the notable exception of that 5th game, in which Kei got 3 excellent returns of serve that directly influenced Federer errors). But more on that later (screencaps will be included!). The number for the third set is hilarious, since apparently Federer’s efficiency during his service games works even when he gets broken twice. Regardless, here’s a nugget you’ll find interesting: Only 31.7% of all shots played by Roger Federer yesterday came during his service games. This simply means that while the Swiss has to put very little effort during his service games, he has to work just as hard as most pros during his return games. – Federer couldn’t create a single break point in the two sets he lost. All 7 break points he created came in the lopsided second set. – In the two sets he won, Kei Nishikori managed to win 37 out of 52 service points. Japan’s Number 1 lost only 7 points on his 1st serve in sets 1 and 3. For Nishikori, these are fantastic numbers. But for Federer, this is extremely problematic. Nishikori’s serve is very decent, but hardly intimidating. 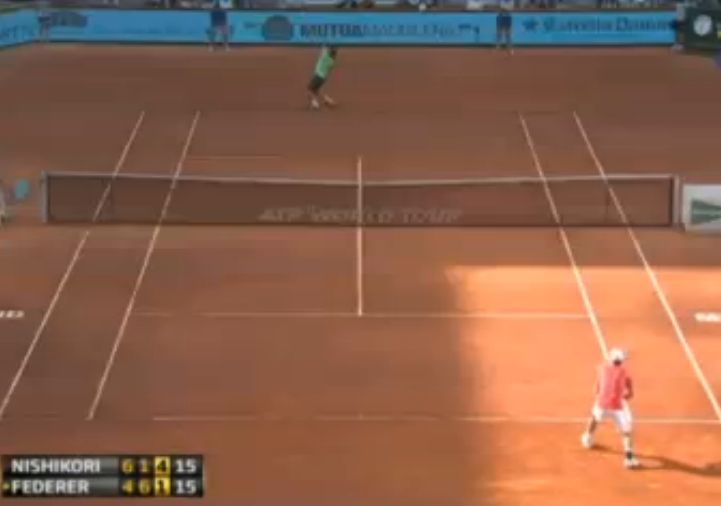 And even though Madrid is a little faster than normal clay, it’s still a clay event. The number of attempts is still pretty low, but here we have to consider that two out of the three sets of this match were short and lopsided. For example, the Janowicz-Berdych match had 5 more games (one of which was a tiebreaker), and Janowicz managed only 20 more attempts than Federer. Add these, too: 48% 1st serves, 50% 1st serve points won, 55% 2nd serve points won, only 7 out of 24 return points won (“good” for 29%, an abysmal number). It has to be unpleasant to play one very good set of tennis (and lose it), then a great set of tennis, and just when you need it the most, play your worst set of the tournament. Of course, these are the kinds of things that happen when you don’t play competitive tennis for almost two months: before easily dispatching Radek Stepanek a couple of days ago, Roger hadn’t played a match since losing to Rafael Nadal at Indian Wells. Obviously, at age 31 Federer wants to preserve his body as much as possible, hence the shorter schedule. However, fewer matches leave you few opportunities to get in a good competitive rhythm. Plus, there’s another aspect to consider. Roger Federer currently sits at number 10 (!!!) in the ATP Race. If you don’t know what that means, it’s quite simple: the Race just counts all the points earned in 2013, whereas the rankings take into account a player’s best results of the past 52 weeks. At the end of the season, the Race and the rankings are one and the same, so you can’t really disregard the Race at all. Depending on how well Wawrinka and Nishikori do in Madrid, Federer could drop back even further. He’s almost 3000 points away from Novak Djokovic already. The point is, if Federer’s results going forward resemble what has happened so far in 2013, his ranking might plummet. As Chris Skelton noted, Federer is the only member of the top 16 who’s yet to make a final this year. And if your ranking goes down, you tend to face better opposition earlier on, which can lead to early losses, which lead to fewer ranking points, and so on and so forth. It’s a vicious circle that is difficult to reverse. It’s likely a good thing for Roger Federer that the tour goes into it’s most maniacal frenzy soon. Next week he’s due in Rome, and a week after that ends, the French Open starts. Halle follows, then a week off, and Wimbledon begins. Odds are, Federer will find his rhythm at some point during his stretch. But if he doesn’t, 2013 will become very problematic for him. Kei Nishikori, as mentioned above, was having a pretty abysmal returning day during the first two sets. Except for that glorious fifth game in the first set, he was having trouble avoiding those classic Federer minute holds. 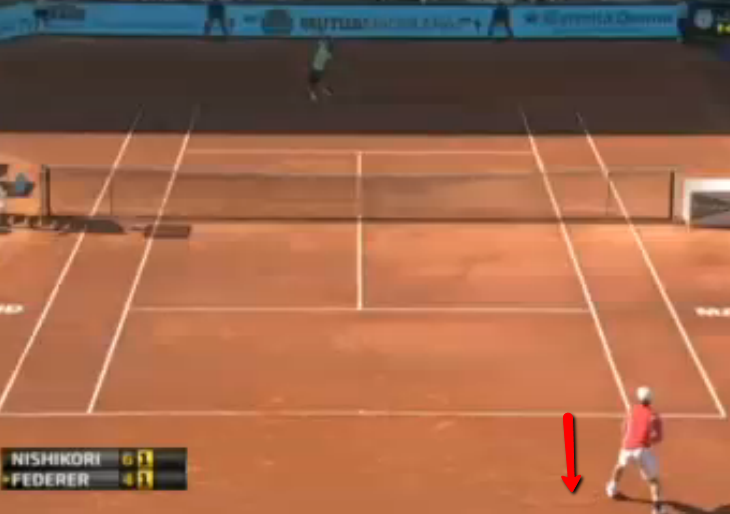 Good returners always move forward, so Kei minimizes the effect of his dubious return position. However, he’s standing further back than he normally does, so he was having quite a bit of trouble getting depth on his returns. 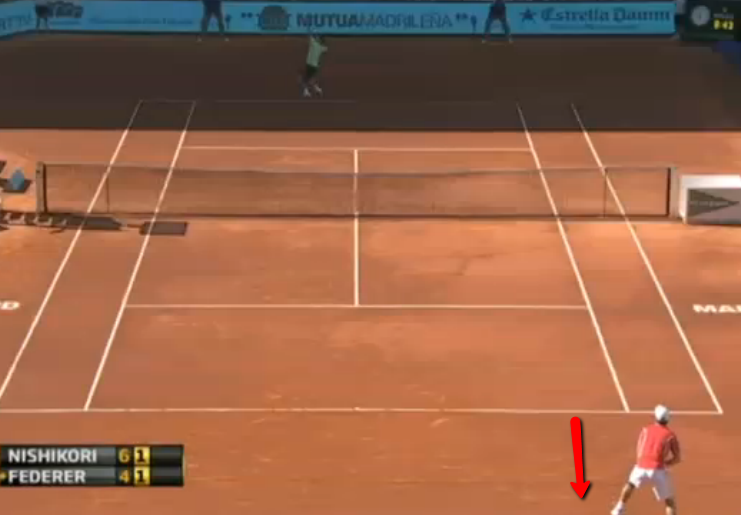 Heck, Nishikori was having trouble getting serves back in play. Once Federer goes up for his serve, Nishikori takes one step forward, and returns the serve from inside the baseline. That’s significantly closer than what we saw for most of the first two sets. It’s easy to overstate the importance of this small adjustment. You can go on and say that Nishikori was getting consistently more depth on his 2nd serve returns (Nishikori won more points off of Federer’s 2nd serve in Set 3 than he did in Sets 1 and 2 combined), Federer’s 1st serve percentage dropped, and the minute holds were gone. The adjustment probably didn’t cause all of these things, but it did enable Nishikori to finally get into Federer’s service games. And given how erratic the Swiss was today, that opening was all Nishikori needed to pull off the upset. I always enjoy your articles about Kei Nishikori. Thank you. Well, he unexpectedly lost to Andujar yesterday. Like federer, some bad day, perhaps. Federer is using the same tatics that was used by Pete Sampras during his last years. Avoiding play many tournaments in order to preserve his body, relaying on his excellent service and forhand to shorten rallies, risking winners on return points. No surprise his has chosen Paul Annacone as a coach. I wonder if that is the best strategy for Federer, considering his strong baseline game.